Beckham died of old age last night, but he’s on his way to a new life. Or so the pet’s owners hope. 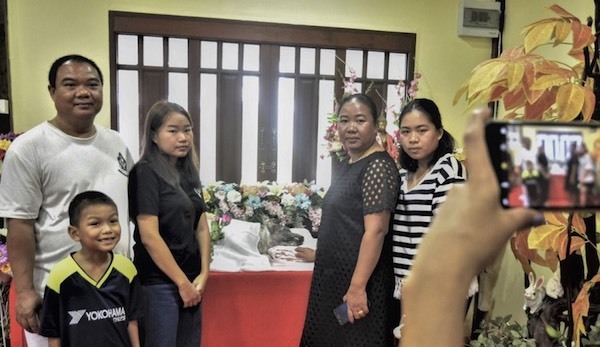 The Suwans, a family of five, have brought the earthly remains of their dead pet to Wat Krathum Suea Pla, a Buddhist temple on the outskirts of Bangkok. They’ve come to administer the last rites to their late canine companion to boost his karmic prospects. “Beckham was like one of my own children to me,” says Saythan Suwan, 43, a mother of two. She rescued the dog from the streets in 2004 and named him after English footballer David Beckham, who is hugely popular in Thailand. A member of the Suwan family places new monk’s robes on Beckham during the service. The robes are donated to the monks on Beckham’s behalf. The stray pup became a loyal member of the Suwan household. He guarded the premises, played with the children and shared a bed with grandma, who died recently at age 84. When Beckham took his last breath, the Suwans bathed his body, sat in vigil, and the following morning took him to the Buddhist sanctuary to be cremated. To help ensure this happens, the Bangkok family have paid for a private ceremony at the temple on their dead dog’s behalf. 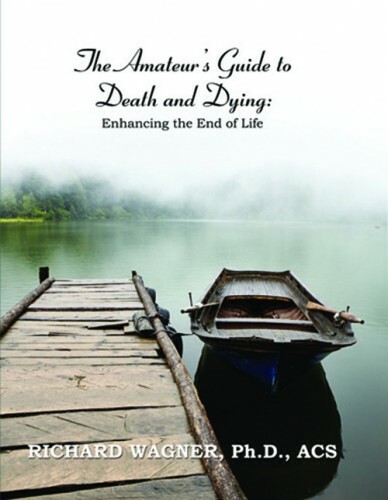 In the predominantly Buddhist country, where age-old superstitions still hold sway, most locals believe that by performing meritorious deeds, such as giving alms to monks, they can earn valuable karmic points for deceased loved ones, thereby hastening their rebirth in an auspicious new incarnation. And for an increasing number of Thais, like the Suwans, these deceased loved ones include pets. The Suwans are gathered mournfully in a small chapel, where Beckham lies draped in lily-white funerary shrouds on a bier among colourful garlands and bouquets of flowers. One by one they sprinkle the dead canine with marigold petals and take turns pouring scented water over him from a small decanter. 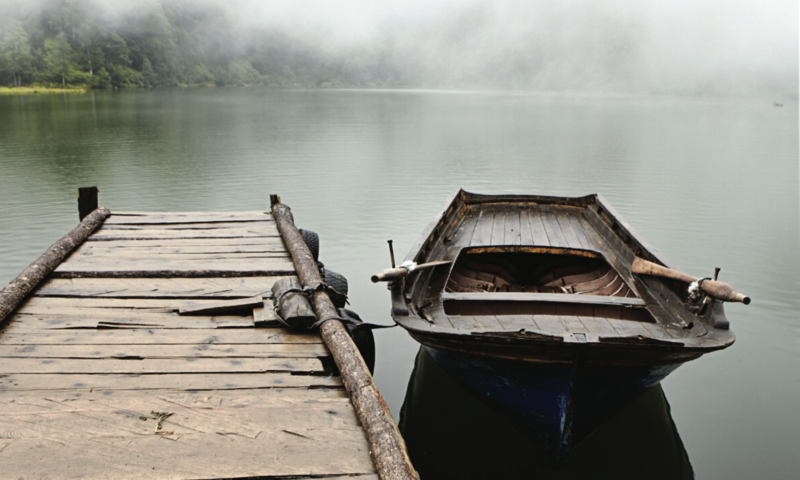 “If I’ve wronged you, please forgive me. If you’ve wronged me, I forgive you,” a funeral assistant intones on account of the dead dog, during a service with stylised rituals that closely follow those of human funerals. A monk places votive offerings on a dog during a pet funeral. Sitting cross-legged on antique wooden chairs inlaid with mother-of-pearl, four monks chant plaintively for Beckham’s benefit. In return, the family offer the monks new robes and provisions in their dog’s name. Beckhamis then taken outside to a small crematorium custom-made for pets, where the Suwans place roses fashioned from wood shavings on his corpse in a final tribute. Outside, another dog is waiting to receive the same treatment. Lying peacefully on a metal table is Nimbus, a 10-year-old husky. He looks as if he is asleep. The night before, he began pacing agitatedly and died soon afterwards, explain his tearful owners, a Thai-Chinese man and woman. A Thai family prepare to scatter their Shih Tzu’s ashes into the Chao Phraya River in Bangkok. Within three hours on this Saturday morning, four dogs and a cat are cremated in quick succession at Wat Krathum Suea Pla. On some days, says Worratap Janpinid, who operates the crematorium, as many as 20 dead pets are brought here for funeral services – mostly dogs and cats, but there have been rabbits, monkeys, birds, tortoises, goldfish and even monitor lizards. “I’ve cremated thousands of pets,” Worratap says. 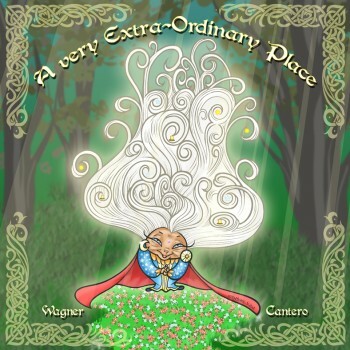 A wiry man in his 20s, he is covered in magic tattoos all the way up to his shaven pate, and wears unwieldy signet rings with protective amulets on several fingers to ward off misfortune and death. “Many people who come here have good hearts,” he says. 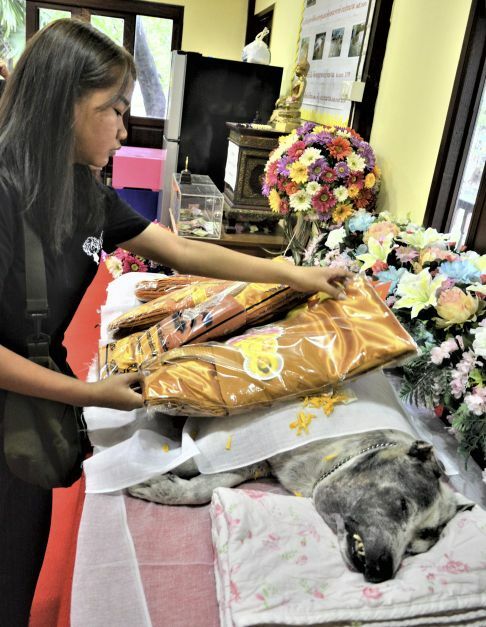 One bereaved dog owner drove his dead companion 1,000km to the Bangkok temple from the southern Thai province of Satun for a proper pet funeral. The sanctuary lies in a warren of winding streets in an industrial area that was once marshland. 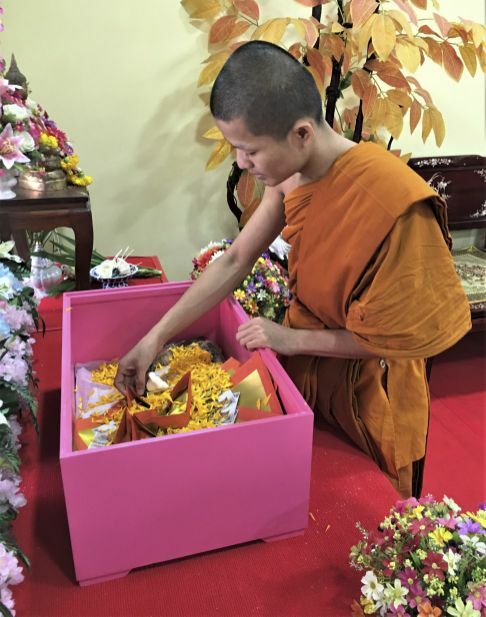 It’s one of the few Buddhist temples in Thailand that assist pet owners in administering proper funerary ceremonies for their animals. 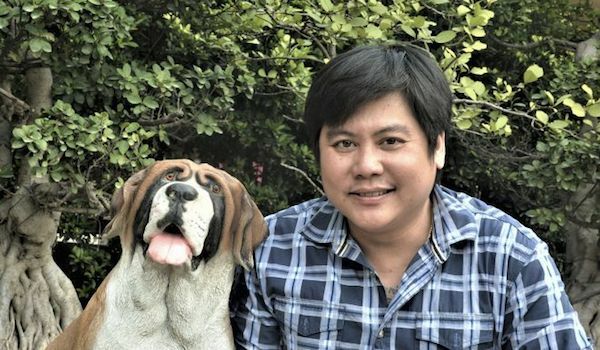 Teerawat Saehan, the owner of Pet Funeral Thailand, that specialises in elaborate funerals for pets at Wat Krathum Suea Pla, in Bangkok. Many other temples dispose of the bodies of pets and stray animals, but they do so with little ceremony. Routinely, the carcasses of beloved pets are burned in incinerators, often without their owners’ knowledge. This practice appalled Teerawat Saehan, the proprietor of a pet grooming salon who was invited by a customer to a dog’s funeral. “It looked as if pets were treated like rubbish,” he recalls. Business is booming. 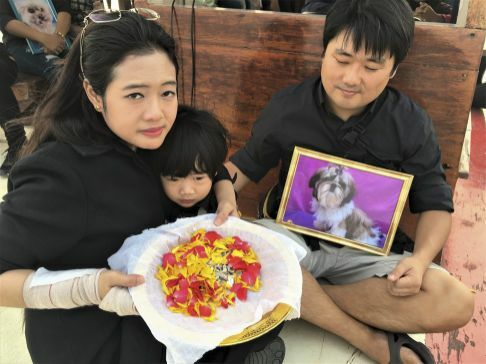 Each month the company hosts 300 to 400 pet funerals, which cost anywhere between 1,500 baht (US$48) and 400,000 baht. The price depends on variables such as the length of the service and the number of monks present. The most expensive pet funerals are overseen by as many as 60 monks and feature special funeral processions, including motorcades. At some of these funerals, the flower arrangements alone can cost 100,000 baht. But it isn’t these lavish affairs that impress Teerawat. He’s more moved by acts of generosity by poor people. Not long ago, a hard-up family’s two dogs died in a house fire that sent all their possessions up in smoke. With the little money they had left, they paid for a proper funeral service for their dogs. In a similar show of kindness, when a street dog called Daam (“Black”) died, vendors at a food market where the dog had lived on scraps all chipped in for her funeral. They even brought food for her so she wouldn’t go hungry in the afterlife. Lolling indolently at the side of the pet crematorium is a stray black mutt, also called Daam. She was dumped last year at the temple with a broken foot and has become something of a resident mascot at cremations. She seems oblivious to the mournful goings-on around her.